I have to admit, the first time i saw the hand-shaped blooms of this tree, i was a bit spooked. 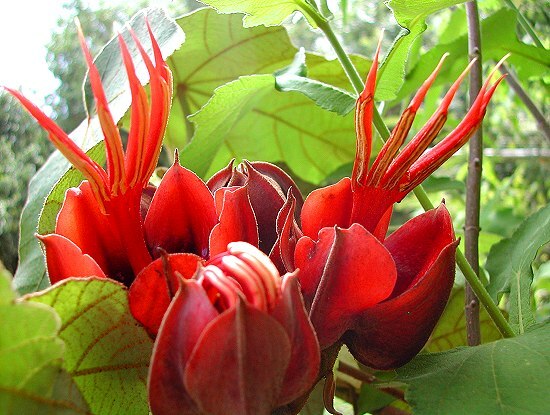 The Devil's Hand Tree (Chiranthodendron pentadactylon) is an unusual, rare tree with devilishly shaped flowers! 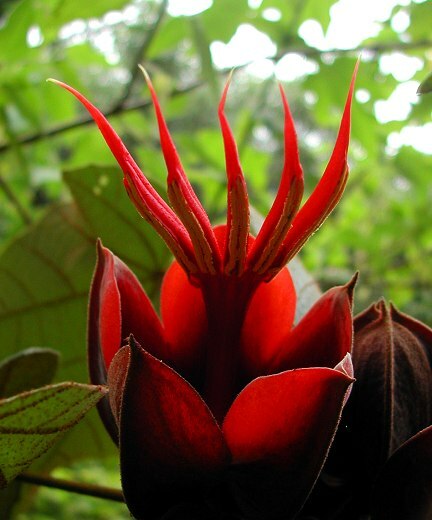 But don't be afraid of it; the Devil's Hand Tree - also called the Mexican Hand Tree - is a wonderful, one-of-a-kind beauty that should be more widely grown. This is a very hard to find plant, and genuine, fresh seeds (not stored) are rarely seen for sale. 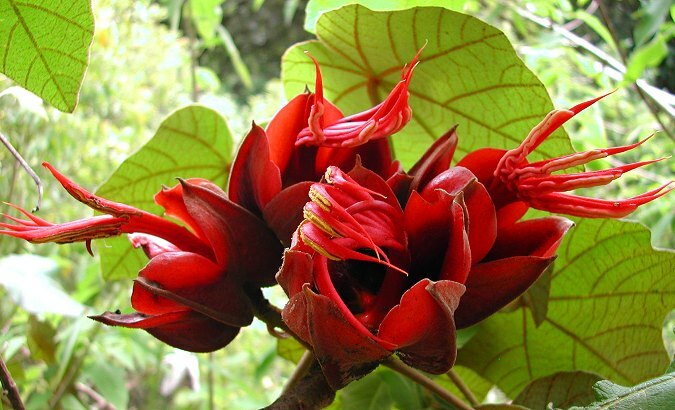 The Devil's Hand Tree is an evergreen species native to Guatemala and southern Mexico, where it is becoming endangered. It is fast-growing to about 40 feet tall here in San Francisco. The oversized leaves are really cool, with their fuzzy undersides and coppery veins. The bizarre flowers appear in the spring and summer. Each 5 inch blossom has five red stamens that branch out like fingers, with vivid yellow pollen on the "knuckles". As the blooms age, the "fingers" curl under like a clawed hand! These are truly amazing blooms, unlike anything i've ever seen. Shaking the devil's hand! The flower and seed pod. Inside each cup-shaped blossom is a glossy, red & yellow interior that almost looks like a porcelain goblet. Water collects in the upward-facing blooms and birds like to sit and drink the nectar. 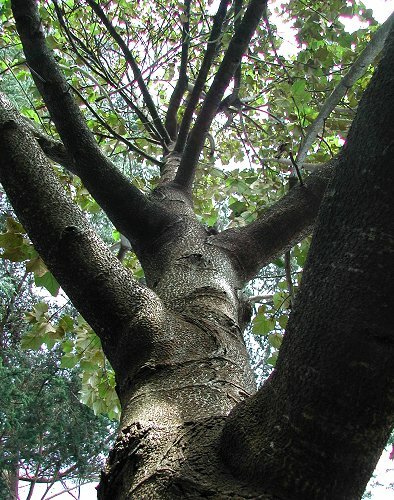 In the wild, the tree is said to be pollinated by bats! 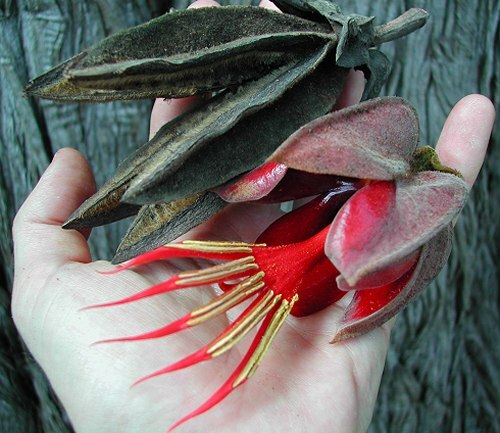 After flowering, the Hand Tree makes fascinating 5 inch seed pods that are almost indestructible. The Hand Tree comes from mountain cloudforests, where temperatures are moderate year-round, and nights are cool. I have no information on how much heat it can take, so consider it experimental in warmer areas like Florida or Texas. It is reported to be hardy down to about 20 degrees F (-6 degrees C), but younger plants should probably be protected from extremes in temperature. It appreciates some humidity, and prefers full sun and well-draining soil. In warmer areas, some afternoon shade may be needed. Unfortunately, fake seeds of it are being distributed from China. I guarantee that my seeds and plants are genuine!